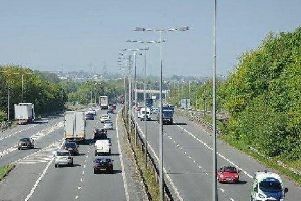 Lancashire Police said a female died as a result of a collision on the M61 at Bamber Bridge. Lancashire Police have currently only described the passenger as 'a female'. The incident happened on the northbound carriageway shortly before 8pm yesterday. Two fire crews from Chorley and one Bamber Bridge attended, said Lancashire Fire and Rescue Service. No-one was trapped and firefighters and police attended to a casualty prior to the arrival of ambulance paramedics, who took the casualty to hospital. A spokesperson for Lancashire Police said this morning that there had been a fatality. "It was a female. She died in Royal Preston Hospital, " said the spokesperson. "She was a passenger in one of the vehicles." Lancashire Police are due to issue a witness appeal.